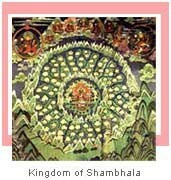 Shambhala is a mystical kingdom as well as the only pure land situated in this earth. Shaped like a giant lotus having eight petals, it is surrounded by rin vgs of snowy mountain ranges and is shielded from the outside world by its natural geographical composition and by supernatural forces. Its inhabitants are born there because of pure karma and they live according to high moral precepts. Being the inhabitants of the only pure land in this turbulent world, they lead a highly evolved spiritual life free from suffering and strife. They practise the highest tantric teachings of the Buddha such as the Kalachakra. The kingdom is ruled by a succession of Kings called the Kulika. We are now in the reign of the 21st Kulika King (AD 1927-). During the reign of the 25th Kulika King (AD 2327-), the world that we know of will be conquered by an evil conqueror. Having subjugated the entire world he will discover the existence of Shambhala and will attempt to conquer it. The Kulika King Rudra Cakrin "Wrathful one with the Wheel" will then amass a great army and vanquish the evil conqueror and his allies in the final great battle of this world (AD 2425). The victory will herald in a golden age of perfection for mankind lasting a thousand years during which the spiritual practice of Vajrayana Buddhism especially that of Kalachakra will lead many to liberation and enlightenment. On the occasion of His Holiness the Dalai Lama's giving the Kalachakra initiation in New York, 1991, Khamtrul Rinpochey gave the following account of his visionary dream of Shambhala in a public talk. The talk was translated by Lotsawa Tenzin Dorjee. I am very happy to have this opportunity to tell of a dream I had in which I had a vision of Shambhala. First of all, I want you to know that we cannot rely too much on the kind of dreams that we usually have, but the dream that I'm going to tell you about was a true dream and I am happy that you are here to hear about it. Kalachakra Tantra or the Wheel of Time Tantra belongs to Vajrayana Buddhism and comprises the inner-most essence of the 84,000 categories of Lord Buddha's teaching. Buddhist Tantra as you know is classified into different categories or divisions. There are father and mother tantra and non-dual tantra. Kalachakra Tantra is considered a non-dual Tantra and is, in fact, the unsurpassable Tantra. The purpose of the Buddhist Highest Yoga Tantras such as Kalachakra is to help us purify the defilements our body, speech and mind as well as their imprints on our mental continuums. This is because the defilements and imprints on our minds won't just go away by themselves. We need to practise in order to purify our defilements and that is the purpose of Tantra. First of all we need to receive empowerment,ripen our mindstreams and then we must receive a explanation of how to do the Tantric practice which is called the liberating commentary. Again it's not enough just to receive the initiation and commentary. The most important things is to put the Tantra into practice, only then will we be able to attain realisations. We all know that the primordial pristine awareness that we all have is undefiled and uncontaminated, nor has it ever been defiled by any kind of obscuration. It contains the seeds of all kinds of realisations which give rise to the enlightened body, speech and mind, as well as enlightened activities and great compassion. Many people in the past have actualised all these extraordinarily remarkable qualities and many will attain them in our time and in the near future. It is important first to understand that our primordial pristine awareness is really undefiled and very pure in its nature. For us to be able to experience this pristine awareness deep within us, it is essential that we receive a Tantric Empowerment. The Kalachakra Initiation that we are going to receive in a few days is essential for us to ripen our mindstreams and experience this primordial pristine awareness in the near future. The Kalachakra Tantra is very much related to the Kingdom of Shambhala in the North. Although there are different opinions about when the Buddha taught the Kalachakra Tantra, whether is was one month before he passed into Nirvana or shortly after his enlightenment, there is a consensus that he taught it at Dhanyakataka which is now identified with the stupa of Amaravati in South India. The main disciple to receive the Kalachakra Tantra from Shakyamuni Buddha was King Suchandra, who was probably an Indian king, who subsequently took it back to the kingdom of Shambhala, in the North. He built an inestimable mansion for Kalachakra and according to the history there were seven dharma kings after him, and following them Manjushrikirti was the first of the lineage holders or Kulika kings. Up to the present there have been 21 lineage holders. Some people do not believe that the kingdom of Shambhala exists, many others do believe in it. My own feeling is that Shambhala does exist, otherwise it would be difficult to accept the statement that Shakyamuni Buddha taught that Kalachakra Tantra and that subsequently there have been seven dharma kings and 21 lineage holders. We are all very fortunate that His Holiness the Dalai Lama is here in New York to confer the Kalachakra empowerment. I consider myself as one of His Holiness' s dullest disciples, but here this evening I am going to tell you about the vision I had in a dream of Shambhala when I was 16 years old.When I was about 15 or 16 years old I had trouble with my mind. It was often upset and unbalanced; I had no equanimity. No one was able to figure out at the time what my problem was. It was just that I wasn't doing very well. So, because my principle spiritual guide, Jamyang Khyentse Chokyi Lodro, was with us at the time, we asked him to do a divination for me. The result of the divination was that I should visit a sacred place called Rawa Gon gi Chak Phurba in Minyak, Eastern Tibet and recite an extensive prayer to Guru Rinpochey, Padmasambhava 400,000 times. Because I was lazy I wasn't able to complete the number of prayers that my root Guru had recommended. I only managed a little over 200,000. If I had been able to say them all I would have remained a great Lama or teacher, but maybe my luck ran out and I unfortunately couldn't complete the recitations. I was doing my recitations in that holy place where there is a building called Podrang Nga-tseg, the five storeyed palace, but because it is on the border with China we weren't readily able to get tsampa, so I had to return home after a couple of months. If, in the future, any of you are able to visit Tibet, especially the region of Minyak Jeten I mentioned a little while ago, then you might find the beautiful cave where I spent my time and did my practice. Of course, if you can't find it, you might think I'm telling you a lie (laughter). It was while I was in that sacred place that I had an unprecedented dream. So if you give me your full attention I think that it might interest you. This was how she showed me that she was, in fact, white Tara. She then insisted that I should look straight into her eyes, explaining that it create conditions for a long life. My predecessors lived only until they were 48 or 56 years old, but I'm already 64 and I've still got some years to live. She told me I wouldn't maintain my celibacy, but in another sense there was something of great significance behind my getting married. We Nyingmapas are especially fond of auspicious signs and I think my dream indicated something very auspicious. The beautiful girl said, 'Let's go to Shambhala'. When I was 16 I had heard about aeroplanes although I had never seen one. She asked me to sit on a white cloth, but it definitely wasn't an aeroplane. She sat next to me which filled me with bliss. I developed so much confidence in her that I was completely free of doubt. I experienced there different states of mind as if they were competing with each other. I experienced such bliss without the slightest disturbing conception in my mind. I had a kind of experience that was beyond any ordinary explanation. Those were the circumstances in which our flight to Shambhala started. If I compare my flight to New York to the flight in the dream, the dream flight was probably nine times as fast. If I could always to that fast, I would be able to visit New York from India three times a day. As we were on our way to Shambhala we looked down on many other regions. She pointed out Chamdo, Lhasa, Tashi Lhunpo, Kailash and so on, but there's no need to go into the details of all those places now. When we had passed Mount Kailash we saw another magnificent region of snow mountains, rocky mountains and mountains covered with grass. The region was very sparsely was about to catch a frog. And then we saw a desert which looked like a tiger's skin laid flat on the ground. Then there was another place which wasn't exactly round, but was the shape of a drum. We reached a very great desert, a barren land. As we were flying over it I had the feeling that there was no form of life there at all. As we continued to fly northwards we came across a region beautifully encircled by mountains. It's difficult to describe the geography of the place, but I felt it looked like an open lotus with 32 petals. In a thanka painting you normally see eight or sixteen petals. It was very spacious it looked huge, but excuse me for not being more precise. My companion told me that there were as many as 32 great cities on each petal and each city was as big as New York city. Although there were 1034 great cities in that region. She told me that each city was surrounded by up to 900 towns or small cities and I felt that they were also as great as New York. She told me altogether there were 921,600 small cities. We might feel our world is marvellous and full of wonderful things. It doesn't even approach the cities of Shambhala. Their architecture style was similar to the Nepalese and Chinese. There were a number of magnificent buildings in each city, with golden roofs and parapets. They looked like the inestimable mansions of deities, decorated with the heads of crocodiles, garudas and I felt that this must be where the big shots in Shambhala lived. (laughter) They were magnificent palaces, decorated with sparkling jewels, tinkling bells and beautiful rainbows. I felt such ecstasy and bliss just looking at them. As I remember there were multi-storeyed houses, but with single roofs very similar to ours. Each family owned a beautiful park containing ponds of scented water. They also possessed the wish fulfilling jewel and the wish fulfilling cow and cow and great wealth. These in business or cheating others. because whatever they wanted just happened spontaneously. So, there was no business management in Shambhala. The entire population of Shambhala enjoyed physical and mental bliss, they were rich, healthy and experienced no sickness or war. I felt that they were all born miraculously - not like us from a mother's womb. Perhaps the most extraordinary quality of that kingdom was that there was no sense of you and I. People wouldn't talk in those terms, which means there was no jealousy or competition between them. There was complet and perfect peace there. Nevertheless, I felt that in Shambhala there weren't only human beings but also celestial beings, nagas and yakshas and so forth. The reason I felt there were other forms of life there is that I remember seeing many transparent, light buildings - not solid like ours, but just transparent buildings of the nature of light and I imagine they were the dwellings of these other forms of beings. 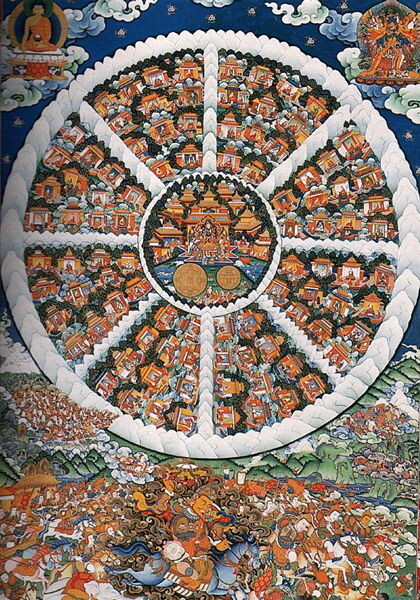 At the heart of the kingdom of Shambhala, surrounded by the great cities, was the inestimable celestial mansion of the deity Kalachakra which had been constructed by King Suchandra. Now I was thinking that I should talk a little about Kalachakra's celestial mansion, but because we are all going to receive the Kalachakra initiation we will have the opportunity afterwards to see the coloured sand mandala which represents it. So lets make a point of examining it in detail then and I won't spend any more time on it now. To the east of Kalachakra's mansion is the great palace of the king of Shambhala. When I had this dream, Shambhala had been ruled since the time of King Suchandra by a line of dharma kings and Kulika or lineage holder kings. The current Kulika king whose name is Chogyal Magagpa or Aniruddha had been already ascended the throne and my companion told me he was 17 years old at the time. As each Kulika king reigns for 100 years, I am 64 now so he must be 65. As I told those of you who were at St. John the Divine, as I understand it the Kulika Pundarika or Pema Karpo is the same as His Holiness the Dalai Lama now. My companion told me that the last Kulika king will be called Rudra with a Wheel, 'the powerful and ferocious king who hold an iron wheel in his hand' is what his name literally means, and he will be none other than His Holiness the Dali Lama, who will subdue everything evil in the universe. Another important thing I want to tell you is that at the time I had the dream, my elders had spoken of their worries about the thousands of people being killed in the Second World War. So I took the opportunity of asking the girl who took me to Shambhala about the prediction in the texts that when the last Kulika king comes to subdue all evil he will do so with bows and arrows, spears, sticks and so on. I asked her how he would overcome powerful modern weapons with bows and arrows. She told me not to worry about that because, due to the power of karma, whatever destructive weapons we produce in this world appropriate counter-agents will automatically come into existence in the Kingdom of Shambhala. She said, 'The weapons you create in your world are created out of experiments with different kinds of materials, but the anti-missile systems of Shambhala have the nature of exalted wisdom and are much more powerful'. She assured me again that I need not worry about the destructive weapons produced in our world because when at the coming of the last Kulika king, he will be ready with anti-missiles to combat them due just to the karmic power of Shambhala. 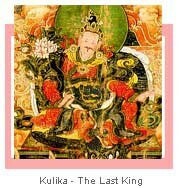 Then we went to see the Kulika who reigned in Shambhala at the time. At the gate of his palace a strong person took us in and presented us before the king, who was in deep meditation. He looked so radiant that I wasn't able to look directly into his face. Afterwards it seemed as though he dissolved into light and transformed himself into a lama who gave me a number of Avalokiteshvara empowerments. After the initiations, everything disappeared like a rainbow, but still the girl and I were there. As I had hoped at the beginning we began to express our love for each other. She predicted that in this life I wouldn't be able to remain a monk, but she said that even if I could not do that I would still be able to benefit many people. Then, I saw in my dream that I had returned to my cave. When I awoke it was dawn and that is how my dream ended. Generally speaking we should not rely too much on our dreams, but we still have a right to dream, you have the right to dream and so do I. So, although I've told you about it, I don't want you to think you have to believe what I dreamt was true or real, but for me at least it was a totally vivid experience. Copyright © 2006 Kalachakra Creations All Rights Reserved.